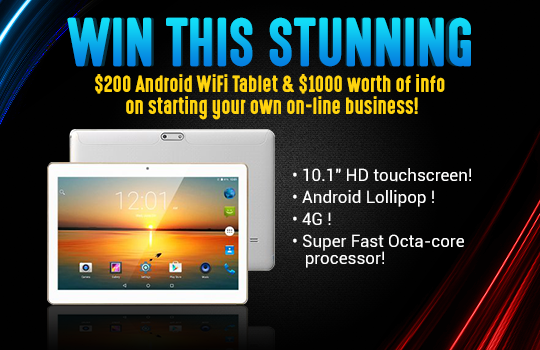 Win a stunning $200 Android WiFi tablet, with $1000 free information on how to start an on-line business! Calling all entrepreneurs! Here’s a chance to win a super stylish Android tablet, worth $200. With 4G, a 5 megapixel camera, built-in GPS and $1000 worth of information on how to start an online business! Thanks to @tabletopincome and @appzthatrock: Enter Here Now.